Chelsea are reportedly prepared to agree terms with Borussia Dortmund over a deal worth £70m for Christian Pulisic. The United States international has been heavily linked with a Premier League move with Liverpool over the years but of late, the Blues are said to have jumped ahead in the player's pursuit. According to The Mirror, the Blues are keen to wrap up an agreement for the uprising star and they could agree on a £70m sum as early as the winter transfer window. 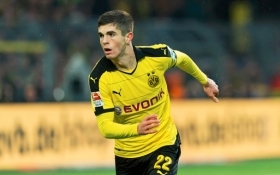 However, Dortmund remain reluctant to part ways with Pulisic mid-season and they may agree upon the move, only if the Blues are prepared to wait for the attacker until the end of the campaign. Pulisic has regularly spoken about the ambition of winning the Bundesliga with Dortmund and that could become a reality this term with Bayern Munich far off from competing for the title at the moment. Dortmund are currently top of the standings with a nine-point lead over Bayern Munich. At present, Borussia Monchengladbach are their closest rivals in the second spot with a four-point difference.